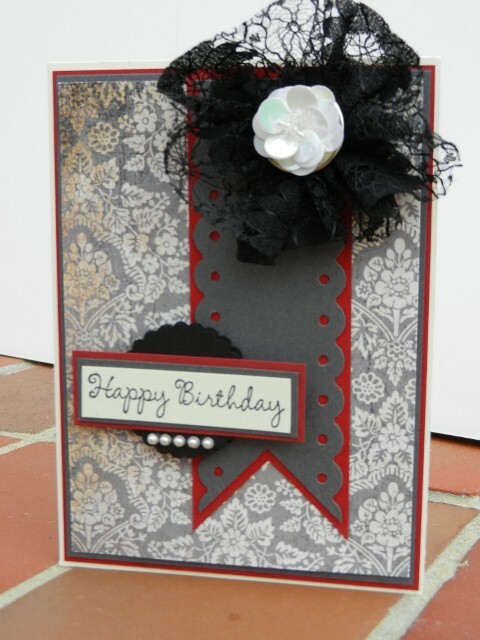 Today we're back with Debbie's cards, who had Basic Grey's "Little Black Dress" Collection. Debbie created 3 cards, one with a great easel fold that you could morph to fit any theme! Let's take a look! I received several sheets from the Little Black Dress collection by Basic Grey, ribbon, "thank you" stickers and Bazzill cardstock for this month's challenge project - design three cards: one masculine, one birthday and one designer's choice. 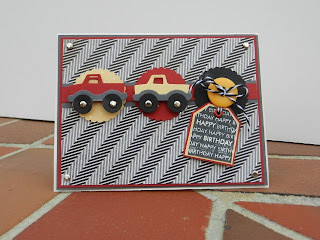 The chevron pattern on Etiquette reminded me of tire tracks and I used that theme for my masculine card. I angled the paper before I cut it to fit the card front and accented each corner with small brads. I also used the brads in the tires of the trucks cut from a 2x2 QuicKutz die. 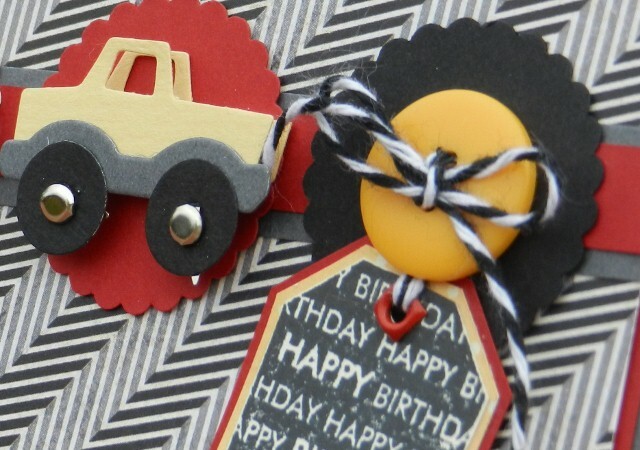 I repeated the circle pattern with a button and some scalloped circles used as the background for the trucks. One of my favorite and most versatile stamps, the "happy birthday" tag hung from the button with twine finished off a quick and simple birthday card for guys of all ages. 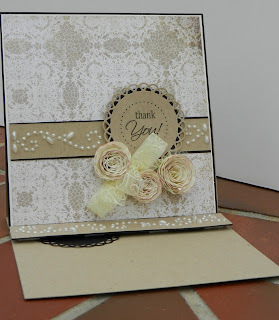 For my 2nd card, I wanted to make an easel card and the cream lace pattern on the Black and White paper seemed like a perfect background for a card you'd want to display on your desk. An easel card is really simple...fold your card to whatever size you want and then make another horizontal fold across the top of the card base. You will assemble the face of the card separately and then adhere it to only the bottom part of the base below the fold. This way, your card will fold flat for mailing but stand up for display. 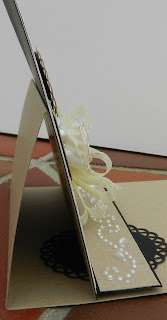 You will want to plan to use a raised bar design for the sentiment inside your card in order to form a stand for the easel front panel. Thanks to Sara for showing me how to make the rolled flowers - see what else you missed by not attending the St. Patrick's Day Crop!. After I spiral-cut the circles, I ran them through my crimper several times to add texture and make the paper more pliable. After rolling the flowers, I added a bit of raspberry ink on the edges for the only bit of color in this monochromatic card. The stickers from SRM are terrific! The backing is clear and nearly disappears into the background and it's a great value with lots of stickers in all styles in the package. 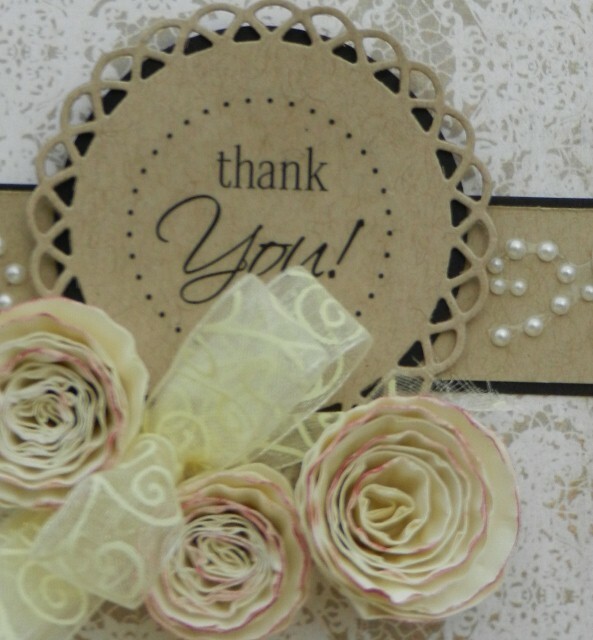 I was left with the Tuxedo gray and cream paper and wide black lace for my last card. 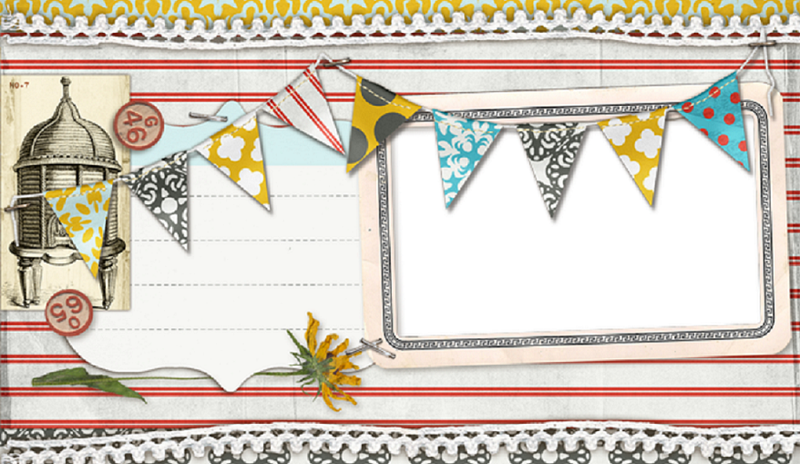 My friend Tina had recently shared a tip with me about using my square punch to make a notch in a banner flag and so I decided to use a banner with a thin red border to break up the pattern. I pleated the lace into a circle and secured it with a brad that I covered with a cream flower made from pearl buttons. I found these embellishments in an opened package in the clearance aisle at Michael's. The stamp is from a Taylored Expressions collection. Thanks, Debbie! Debbie has such a elegant style to her cards! Remember, you can always pop into Page's and see all of the teams projects! We'll be back tomorrow with Becky's reveal! Our Final DT Reveal with Becky!